Does indoor skydiving burn calories? Well: Yes. You don’t have to take our word for it. Instead, just take a look at the top athletes in the sport of indoor skydiving. The ladies and gentlemen that dedicate themselves to the art of plying the windytube are a reliably lissome, toned and strong. There are certainly cheaper ways to gain definition, build functional strength and lose weight than indoor skydiving, but we’ve racked our brain for a cooler one and, honestly, we can’t think of it. Another benefit of indoor skydiving is that flying in the tunnel brings a kind of mental clarity you’ve probably been searching years and years to find. It’s incredibly focusing. Indoor skydiving also presents a unique opportunity to relieve stress, as it combines challenging physical work with equally demanding cognitive acrobatics (called “proprioception” in science-book terms, which is worth a Google in and of itself). Tunnel flying can bring you to an apex of brain-body cooperation that results in significantly better reaction times, mental flexibility and stick-to-itiveness. The benefits of those superpowers can’t help but spill over into the rest of your life. Learning any new skill gives confidence. Right? If that skill happens to be actually learning how to fly, that confidence-building juice gets a lot higher in proof. For some folks, even the act of stepping into the wind tunnel might be a mental hurdle to celebrate overcoming; for others, working towards the lightning-fast, multi-orientational zoomy stuff will be the most deeply rewarding work. In any case, everyone finds an envelope to push in the tunnel, and envelope-pushing practice strengthens mental muscles for tackling real-life challenges. Guess what? It’s not just about making yourself more awesome. It’s about community, too. 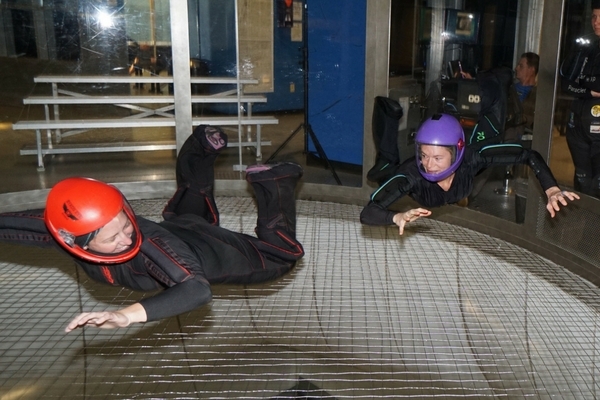 Indoor skydiving as a hobby brings plenty of social benefits along for the self-optimization ride. 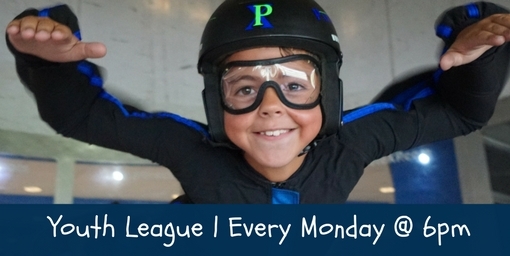 You’ll soon discover that tunnel flying is a terrific activity to share with your buddies, your main squeeze–even your whole family. You’ll treasure the memories you build together in the tunnel. Flying is also a great way to meet people! During your time at the tunnel, you can look forward to building lasting friendships with your fellow athletes. As you advance your skills, join leagues, participate in events, build teams and even start trying your hand at local-, national- and even world-level competition, you’ll become part of a thriving worldwide community. Speaking of thriving communities: We’d love to have you in ours! Stop by the tunnel and say hi to the athletes staring musefully into the glass. We’re sure you’ll find a kindred spirit–and we’re equally sure you’ll find a home-away-from-home here. Let us be the first to welcome you into the family and to show you just how many benefits you can reap from indoor skydiving! Thanks so much for a wonderful first time adventure for me and my 5 year old great-niece; and also my 2nd timer niece. I felt very safe and informed through the whole process. My only wish is that we had ParacleteXP in Minnesota-with you to guide us! Thanks again for a wonderful time. We will DEFINITELY be back next time when in NC.